St Maria Faustina Kowalska was born in Glogowiec, Poland. She was the third of ten children and given the name Helena at baptism. Her devout Catholic parents were poor peasants, her father a carpenter. Her education was basic but she could read and write. St Maria Faustina said that she was first drawn to a religious life during an Exposition of the Blessed Sacrament service at the early age of 7yrs. Although she still wanted to join a convent at 16yrs, her parents sent her to work as a housekeeper to financially support their family. St Maria Faustina was 19 when she had a vision from Jesus who asked her to go to Warsaw and join a convent. The next day she travelled to Warsaw but was not immediately able to join an Order. Indeed, many refused her entry but, at last, the Sisters of Our Lady of Mercy accepted her on condition that she paid for her own habit. Sister Maria Faustina spent the next year working as a housemaid to gather together the clothing fee. On 30th April 1926, then 20yrs, she entered the convent as “Sister Maria Faustina of the Blessed Sacrament”. Two years later she took her first vows in the presence of her parents. On 1st May 1933, she took her final vows as a Perpetual Sister of Our Lady of Mercy. St Maria Faustina spent her early convent years in Warsaw, Vilnius (Lithuania) and Plock. During that time, as well as following the convents rigorous daily prayer life, she also carried out general house duties, gardening and cooking for their community. Her appointed confessor was Father Michael Sopocka, a Professor of Theology at Vilnius University. St Maria Faustina confided in him that she had received visions from Jesus so he appointed Helena Maciejewska, a Psychiatrist and Physician, to evaluate her health. Finding her of stable mind he advised her to make a diary record of Jesus’ messages. 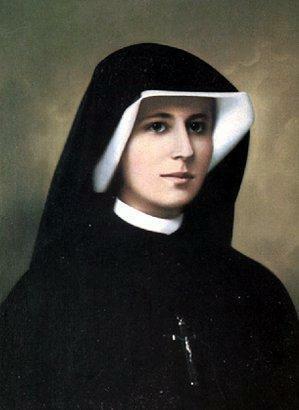 St Maria Faustina continued to receive the visions from Jesus and kept a diary as her confessor had requested. During one of her visions in February 1931, Jesus asked her to make a painting of how He appeared to her. St Faustina was unable to do so immediately but, a few years later and with the help of an artist, the now well-known image of the “King of Divine Mercy” was completed. The painting depicted Jesus wearing a white cloak with a white and red ray of light originating at his heart and spreading out towards his feet. At the bottom of the painting were the words, “Jesus, I Trust in You”. On 22nd February 1931 St Maria Faustina wrote in her diary, Jesus said “I desire that this image be venerated … throughout the world. I promise that the soul that will venerate this image will not perish”. She also wrote that Jesus had asked for the image to be, “Solemnly blessed on the first Sunday after Easter, that Sunday to be the Feast of Mercy”. From 1936, St Maria Faustina suffered from what we now believe to have been tuberculosis. As her health slowly deteriorated, her pain intensified as did her visions. By April 1938 her condition was very severe and her death anticipated. Instead of fearing death, St Maria Faustina was in ecstasy in anticipation of her eternal salvation. She spent her time reciting the prayers Jesus had given to her for the forgiveness of her sins, the sins of others and the conversion of souls. Today the Divine Mercy messages are being answered across the world, bringing many more souls to the mercy of God. There are three main forms of everyday prayer that all are invited to participate in. They are the Chaplet of Divine Mercy, the Novena of Divine Mercy and the Litany of Divine Mercy. This is in addition to the Feast of Divine Mercy, celebrated on the first Sunday immediately following Easter Sunday. St Maria Faustina wrote in her diary on 13th September 1935, the purpose of the Chaplet Prayers were threefold; to obtain mercy, to trust in God’s Divine Mercy and to show mercy to others. St Maria Faustina died on 5th October 1938 aged 33yrs. Her Feast Day is the 5th of October. Her body is interred in the Basilica of Divine Mercy, Krakow, Poland. She was canonised a Saint by Pope John Paul II on 30 April 2000. She is the Patron Saint of Mercy. Pray that we will thank the Lord for his goodness; His daily blessings; His love and His Divine Mercy.